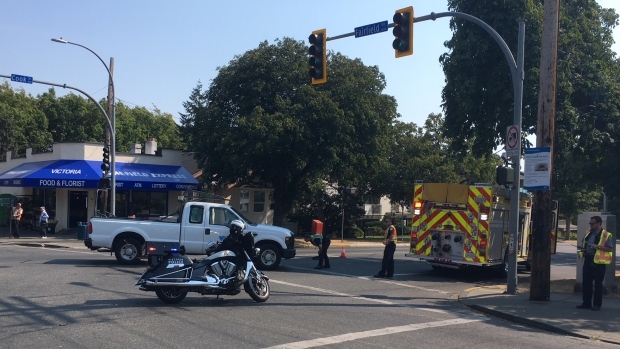 Witnesses say a pedestrian was sent to hospital after being struck by a City of Victoria truck in Cook Street Village Tuesday afternoon. The collision reportedly occurred in the intersection of Cook Street at Fairfield Road. Police haven't confirmed any details, but a witness said the woman was in the crosswalk when she was struck. The intersection was closed to traffic as police investigated the scene. The city truck could be seen parked in the marked crosswalk. The city confirmed in a statement that one of its employees driving the truck was involved in a traffic incident with a pedestrian. City officials say they're now working with Victoria police as they conduct an investigation, and providing any necessary support to the driver.